Point of Shoals – Chesapeake Chapter U.S.L.H.S. Point of Shoals Lighthouse had two lighthouses. 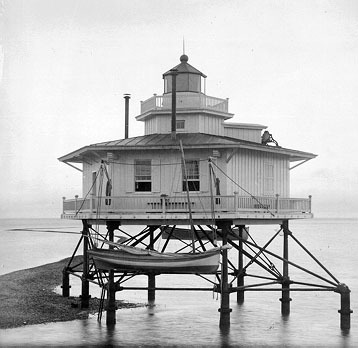 The first was built in 1855 and was a hexagonal screwpile lighthouse with a pressed-glass masthead lens. It was located in Burwell Bay in the James River in Virginia a little below Mulberry Island Point on the right side of the main channel, heading upriver. Confederates made a raid on the lighthouse during the Civil War. In 1871 the lighthouse was severely damaged by ice flows and was rebuilt the same year. The lighthouse was automated in 1932 and deactivated in 1933 after it was rendered unnecessary when the channel was moved towards the opposite side of the river. It was torn down in the 1960s.